Links to “how to videos”, pricing guidelines and safety/recall (to include consignor waiver for car seats & cribs) are located at the bottom of this page. THE VOLUNTEER SCHEDULE WILL OPEN SOON! • Volunteers who complete a total of 4 hours earn 70% on their sold items AND shop early. • Volunteers who work the full breakdown shift earn 75% on their sold items AND shop early. • Shop early AGAIN at the Sunday morning Half Price sale event! • Bring a Car Seat Waiver to be signed at check in. • Children are welcome to join you during drop off. • Allow approximately 30 min - 1 hour for drop off. Depends on quantity of items. 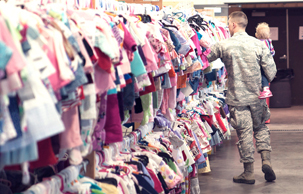 • Drop off time will be quicker if you have your clothing items separated by size and gender (rubber-banding sizes together will help prevent them from separating when transporting your clothes to the sale). • Busiest times are the first and last hours of consignor drop off. • You will place your items onto the sales floor, once they are inspected. ITEMS NOT PICKED UP BY 8:30 WILL BE DONATED TO THE CHARITY -- NO EXCEPTIONS! Rolling racks are available at the sale to assist you in transporting your items, but availability is limited. You may want to bring a wagon or other rolling device to assist in transporting your items. Diaper bags, infant carriers, backpacks, and purses are great consignment items. Please inspect all items carefully for stains, damage & missing pieces. Check company recall lists to ensure they have not been recalled. NO rated R videos books or games! Package: Use clear, self-seal bags or clear cling wrap (saran wrap) to hold multiple items together. Tie sets of books together with ribbon/string. Junior sizes accepted: Abercrombie, Hollister, Roxy, American Eagle, Nike, Volcom, Burton preferred. Button all buttons, snap all snaps, zip all zippers before you arrive at drop off. This will ensure that there are no defects in the clothing. The newer the item looks (and the better it smells), the better it will sell. 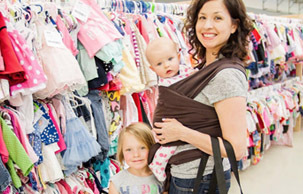 Hang size 0-5 clothing on child-size hangers and sizes 6-16 and maternity clothing on adult-size hangers. Equipment must have all parts, and be in good condition. Children's furniture - beds (toddler, twin), desks, side tables, dressers, etc. Household items (decor) that other families will use (no knick knacks). Shoes must be match the sale season Spring/Summer or Fall/Winter). No adult shoes are accepted - childen's -,teen sizses only. Battery operated toys must include working batteries. Bag all small parts belonging to toys/equipment in self-seal bags and tape the bag shut with clear packing tape. Fasten the bag securely to the item with ribbon, tape, or zip ties. Join the fun & volunteer!